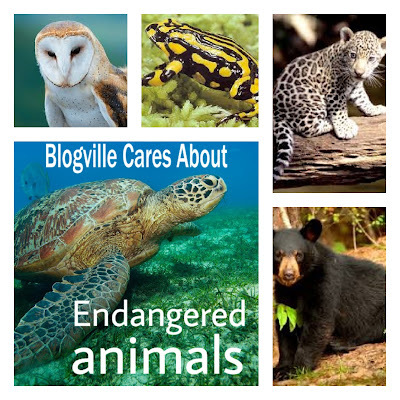 is having an Endangered Species Challenge! to see all the entries! Lookie at these guys! They do LOOOOVES to eat! They eat almost nothing butts Bamboo shoots and leaves! Sometimes they eats fish or small animals, butts bamboo counts for 99% of their diets. They can spend 12 HOURS a day just EATING! They are SHY....wells, maybe this one heard me ask, ''Who wants Cheetos??" OMD! Lookie at that FACE! Okays, for reals, there are only about 1,000 of these black-and-white lovelies that survive in the wild. We gots to do all we can to save these most BEAUTIFUL and DOCILE anipals!!! This is Bert (that's what he told me.....☺), let's do what we can to save him and his pals! to see ALL the Endangered Species Entries! 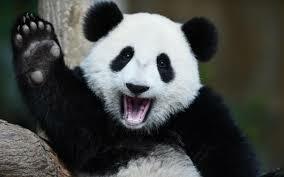 Panda's are super cool and you did great getting the word out. Mom says they remind her of the Belted Galloway cattle and they remind her of Oreo cookies. Google the cows they're pretty. 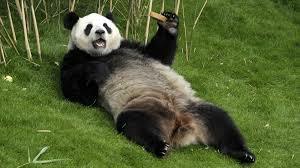 Wow, pandas are SO cool. What a great post, Ruby! Thanks! 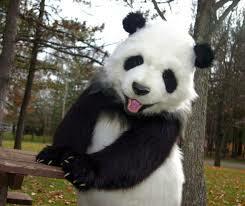 Pandas are such cutie pies! Great post, Ruby! 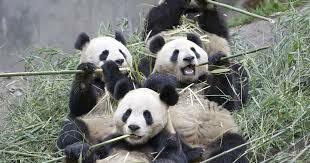 I love giant pandas and we can all get behind eating 12 hours each day! Humans need to do what they can to save these gentle giants. ♥ Maybe more Cheetos? Ruby, we love your pal Bert!!! Mom is crazy about the pandas too. We hope they can increase and multiply and not be endangered any more. WE Saw YOU and BERT over at Louis D. Armstrong's Post... THIS was a grand thingy that he came up with... Blogville did a super job of getting the word out about Animals and Insects that are In Danger of Extinction. Crikey Ruby .... that second pic looks just like I feel after I've eaten too many chicken wings. Those pandas are super cool blokes, aye?? Its great to read about all the endangered species, aye. I loved your post. 12 hours a day eating? I could go for dat! Momma says she got to see Pandas at da San Diego Zoo when she wuz lil. Just so cute! I feel really bad I forgot about the date for the day's event. Mom and Dad were both really sick for a full week and not really up to speed in Blogville. We will add Abby the Lab tot the endangered list of friends that remember things. Pandas do have a lot of cuteness! We love them, too, and are glad so many people are helping them out! That Bert though, he's a cheeky fella scoffing all you cheetos!!!! Save the Dodo bird! Whoops, too late. 12 hours a day eating?! That sounds pawfect! 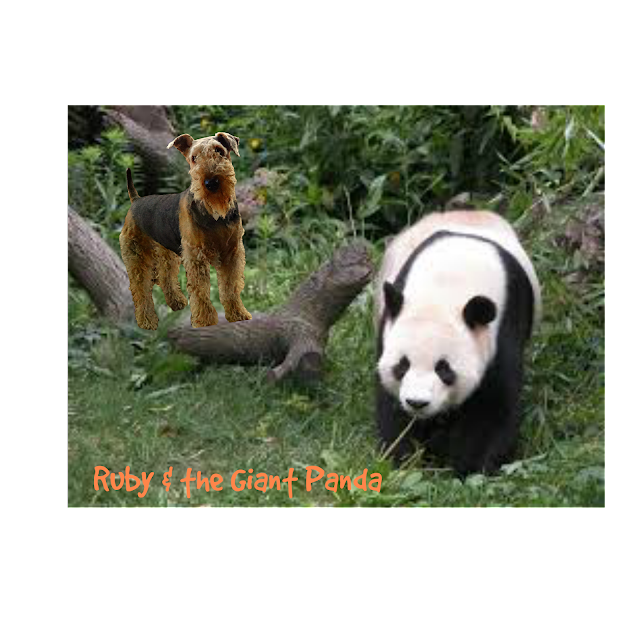 Oh Ruby, we love Giant Pandas too! They look like big old teddy bears...you just want to hug them. Oh the Panda ~ We love the folklore ~ One Tibetan legend of the giant panda is about how they got their beautiful, and unusual black markings. A long time ago, when pandas lived in the mountains of Tibet, they were white as snow. They were friends with four female shepherds that watched their flocks, in the mountains near their village. One day as the shepherdesses where playing with a panda cub, a leopard leapt out of the bush and tried to attack the cub. The young shepherdesses threw themselves in front of the cub to save it and were killed by the leopard. All the pandas in the area were saddened by their deaths and held a memorial service to honor them and their bravery. To remember their sacrifice for the cub, the pandas all wore black ashes on their arms (as was the local custom). As they wept for the shepherdesses, they wiped their eyes with their paws, they covered their ears to block out the sound of the crying and they hugged each other in grief. As they did these things the ash spread and blackened their fur. The pandas did not wash the black off their fur as a way to remember the girls. To this day, pandas are covered with the black markings to always remember. oh we love pandas!!! they look so cuddly. Pandas are so cute. We wish we would be allowed to eat that much. It would be terrible if these beautiful creatures disappeared from the wild. We love Pandas, too. Mom saw one at the National Zoo and have you seen the videos of the Panda nursery in China. They're hysterical. Our mom LOVES Pandas! Great job, Ruby! OOOHHHHH...Pandas look so cuddly. Can I have one???? ?